With worksheets covering important skills like subtracting fractions, simplifying fractions and multiplying fractions, our collection of fraction worksheets is great for practising this important maths concept. 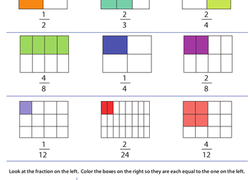 Browse through and download some of these worksheets to help your child learn about fractions. Help your third grader tackle equivalent fractions with this fractions practise worksheet that helps her see the concept visually. Fractions, like many other maths subjects, are an essential skillset to learn due to the plethora of real world applications. But it can also be a daunting task, especially for kids still struggling in other areas. 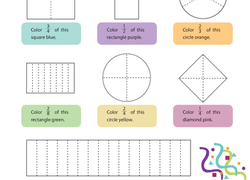 To ease the struggle and help kids discover how fun fractions can be, we’ve put together a wide selection of worksheets that cover everything from fraction fundamentals to converting, dividing, and simplifying fractions. Introduce your youngest learners to the concept of parts of a whole with colorful worksheets that use shapes, robots, food, and other pictures to help kids visualize and conceptualize how to create, add, and subtract fractions. As your child gets more comfortable with the basics, there are many creative worksheets that help them explore equivalent fractions, mixed numbers, decimal conversions, and more. Tape diagrams, area models, and number lines are just some of the strategies kids will learn to employ to make sense of trickier problems. Plenty of practise both on paper and at home (think measuring cups, telling time, and calculating mileage) are key to helping your child become fluent in fractions.